UAMS staff visit with one of the attendees at the Senior Expo at the Statehouse Convention Center. Sept. 28, 2018 | More than 1,500 seniors thronged the Statehouse Convention Center in downtown Little Rock to add another banner year to the Senior Expo’s history of success. Jeanne Wei, M.D., center, and Rohit Dhall, M.D., right, discuss “New Treatments to Stay Steady on Your Feet” at the Senior Expo. 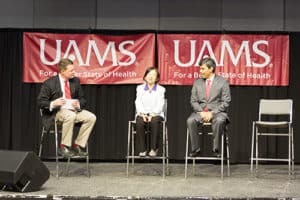 Sponsored by UAMS and presented by the Arkansas Democrat-Gazette, the event pulled visitors from throughout central Arkansas and beyond. About 225 seniors received free health screenings for blood glucose, blood pressure and heart rate as well as medication and vaccination education. The UAMS Donald W. Reynolds Institute on Aging provided geriatricians to give free consultations throughout the day at the “Ask the Doctor” booths. UAMS Harvey & Bernice Jones Eye Institute staff performed 67 vision screenings. 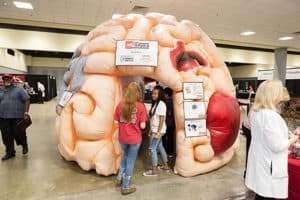 Visitors at the Senior Expo explore the inflatable Mega Brain model to learn about stroke and other brain injuries and disorders. 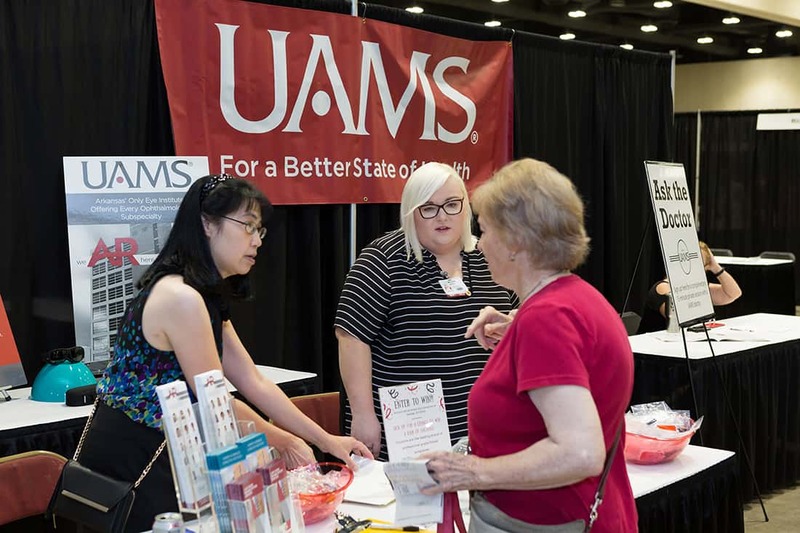 Among the UAMS services and medical specialties represented at the Expo with booths were geriatrics, orthopaedics, caregiver training, ARresearch, stroke, vascular, cancer and nutrition services. Presentations made by UAMS physicians included: “New Treatments to Stay Steady on Your Feet,” Jeanne Wei, M.D. and Rohit Dhall, M.D. ; “Hip and Knees How to Stay Active as You Age,” orthopedic surgeon Paul Edwards, M.D., and physical therapist Amanda G. Williams; “Time is Brain: BE FAST,” neuroradiologist Martin Radvany, M.D. ; and “Moans, Groans, Stones and Bones: The Highs and Lows of Calcium and Vitamin D,” head and neck surgeon Brendan Stack Jr., M.D.